Homing Requirements: China needs a home where her needs are central to her family. 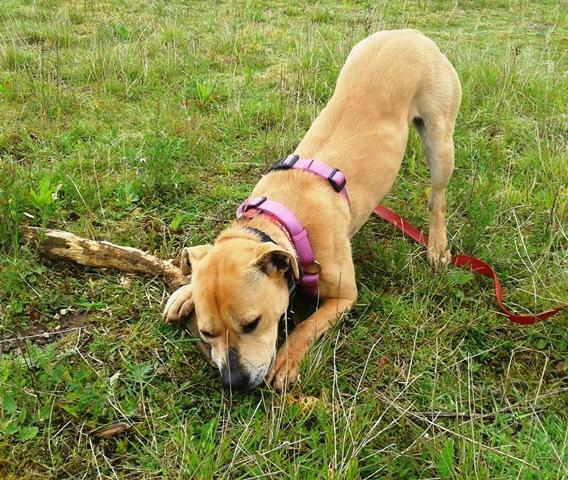 She can be left, can live with another dog or 2 and needs support building her confidence meeting dogs outside on her walks. She would enjoy a secure garden with an inclusive life style i.e. sleep in the bedroom rather than in the kitchen as Staffies tend to enjoy. China could live with respectful children. Unassessed with cats. Her Story: China was found stray and unclaimed. 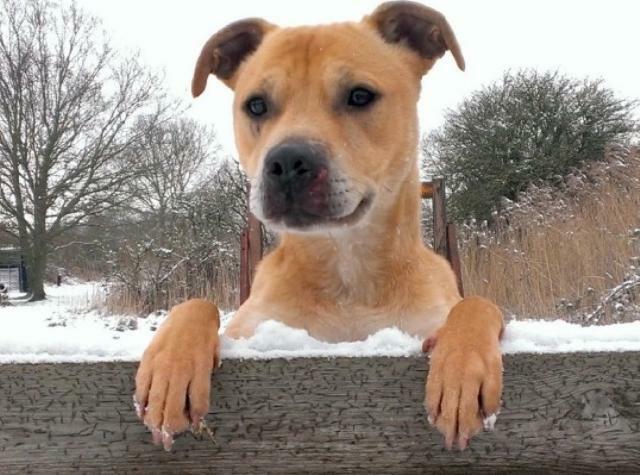 She waited far too long in the pound for a rescue place but is now with us and is amazing. We have certified she is spayed and is chipped and vax'd. China is fostered in Hertford, Hertfordshire. Advert: How are you my 'old China!' Very well, so ready for my new life and excuse me I'm not old! China is actually not delicate either, well only as the 'flower' of beauty she is. 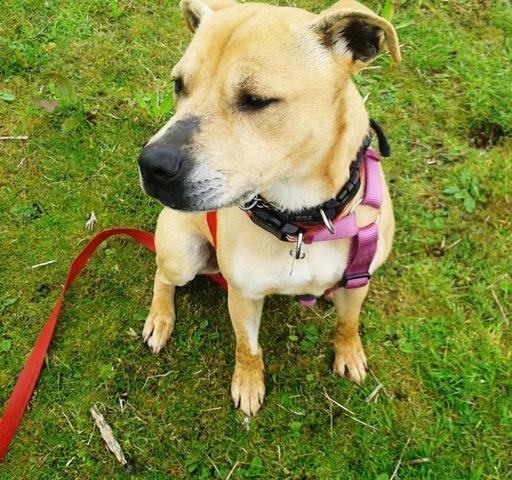 China shared a kennel with a male Staffie and is now sharing her foster home with 4 female Staffie X’s and she has been learning to develop the tolerance and accommodation living in a pack demands. China picked up with housetraining very well despite prolonged kennelling. She is versatile and responsive to her owner's wishes. She loves to play and is enjoying life again to the full. 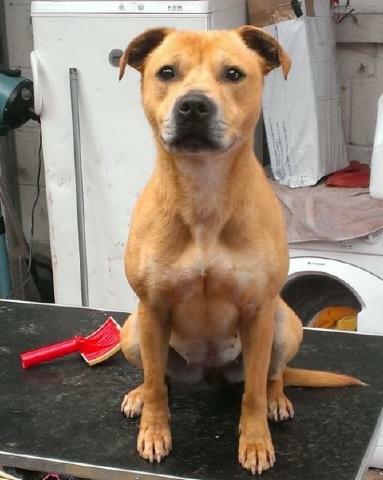 China is a 3 year old Staffie with a pale tan coat and black muzzle. She is about 15" to the shoulder so small and still under weight but building health being in loving foster home. 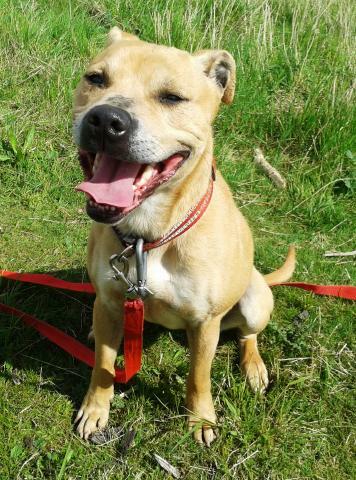 China is a pretty little thing and deserves a family of her own who can offer her the support she needs. Interested in homing China? 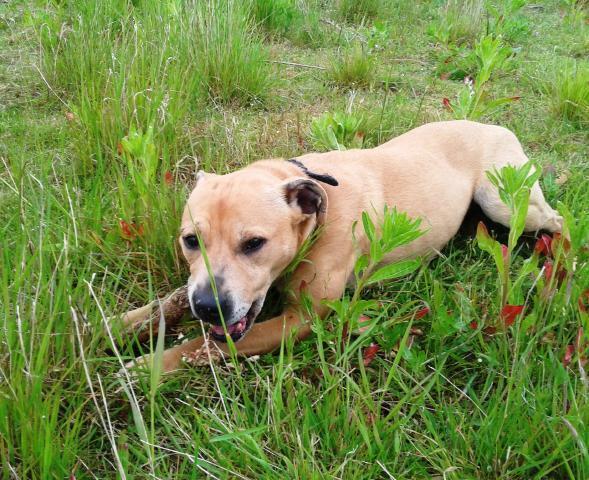 Please click to complete our on-line homing questionnaire to match a suitable dog with your lifestyle. Guess who arrived in the 'staffylevi' household today...!!! The absolutely adorable China; what a fab girl, reminds us a little of Jasmine when we first got her and a little bit of Chancer especially in the pic below. She travelled well in the car, slightly whiny but nothing that a quick stroke and a bit of reassurance didn't cure. 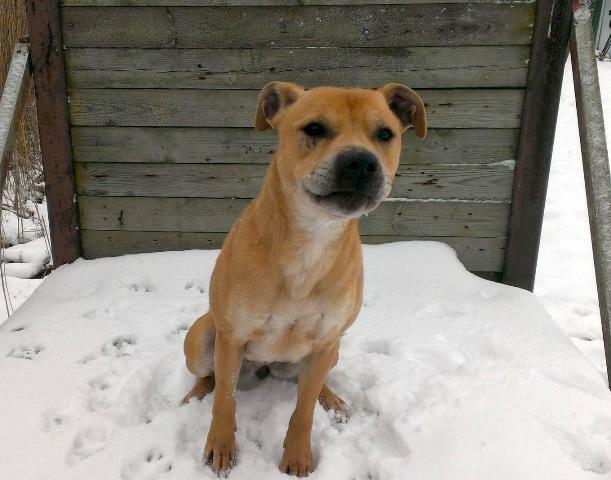 China is medium-sized staffy x, a little underweight but nothing major; I took her to the vets this afternoon for a post op check as she will be being spayed tomorrow and she weighed in at 16.7kg so not too bad. 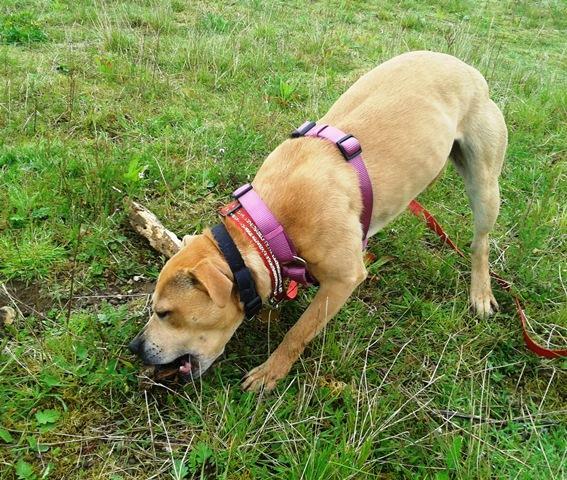 When we got home I took her for a walk in the wilderness behind our house on a long line and to say she walked fab would be an understatement; it's so lovely to have a foster on the first day that isn't trying to pull your arms out of your sockets...!!! She met the girls but the timing was terrible as Lee had just come home from work and they were all hyper for their dad as they always are so there were a few barks between them and a few snarls from our China girl. She hasn't had much socialisation but we're sure in time she will become the best of friends with the girls. She's been out in the front room with them when they were calmer and everything was good. The girls will teach her the right way as they've done this many times before. I will update on her op tomorrow but for now I'm off for some China cuddles. China's op didn't go ahead as there is some speculation that she could already be spayed... we are investigating! This little lady has been with us for two nights now and is very clean, no accidents at all. She is a good little eater with no signs of food aggression. She's very unsure of the girls at the moment and has lunged a couple of times if they get too near; she's is just overwhelmed by them all. At a safe pace she takes no notice. Having said that though she has been laying on the sofa with me or Lee where the girls have also been present and currently she is under the duvet to one side of me while Jasmine is under the duvet to the other side of me. 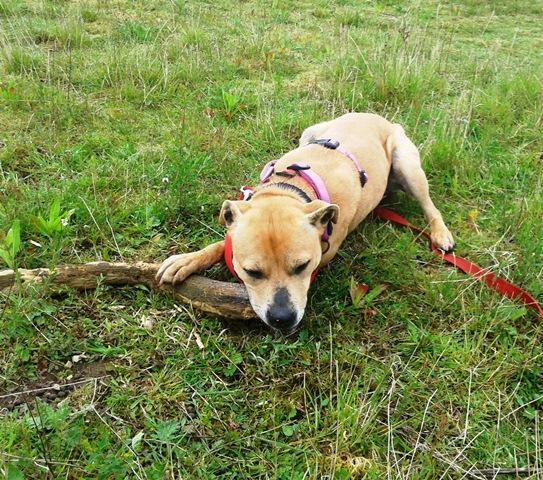 In the past we've had a few staffies like this who have ended up sleeping and interacting brilliantly with the girls... remember Chancer!!! Watch this space!! The girls are very laid back in this respect and will teach her some doggie ettiquette - hoping none of their bad habits rub off on her!!! Not much more to report at the moment except this little girl is very reponsive to command, has the most gawjus soft fur like luxurious velvet and absolutely loves laying upside down for a belly rub and she'll very easily fall asleep if snuggled on your lap or enveloped in your arms. Cute as a button! Will get some pics as she settles. Not really a lot to report on little China at the moment. 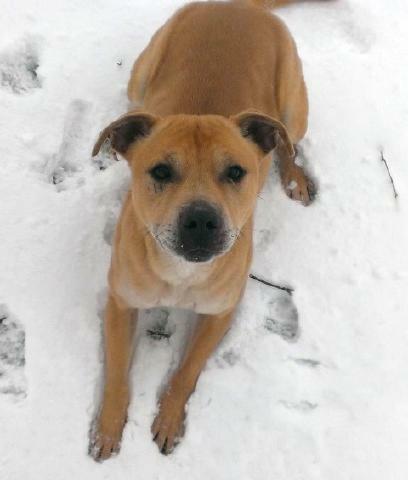 She's a lovely girl who absolutely adores human company; she's very respectful of commands and absolutely loves snuggling under the duvet... what self-respecting staffy doesn't!!! She's still unsettled around the girls and in particular Lois for no reason whatsoever on Lois's part, we think it's a case of no social skills and doggie etiquette. Luckily she is with a good pack as none of them will retaliate so we step in to hopefully teach her right from wrong. She seems to have taken a bit of a shine to Jasmine as she is the calmest of the girls. Having said all that she does sit next to the girls with us and doesn't always lunge only on the odd ocassion... she's a work in progress on the doggie front but we're sure she will get there. She loves to roll around in the grass and play and she defo loves a tummy tickle. 100% housetrained and does her business in the garden in the same place every time... what a good girl! No news on her spay investigation as yet but we're working on it!! Sorry no pics ... will post when I get some more. China goes back to the vets for her post-op check on Monday evening, then at her next check up she'll be first vax'd and well on her way to being ready for her forever home. I know you all want pics but camera and phone are on overload at the moment!! I just know she will gain loads of confidence with you and your pack.